Discussion in 'Gibson SG' started by pancake81, Feb 12, 2019. Well, I am going to pretend that Gibson read my post a few weeks back about the 1961 reissuebwith the vibrola. It of course never existed, so I suggested Gibson call it any other year other than a 61. Well... Viola, they took my advice :) They called it a 64! Nice to see some change up. Looking back, I feel like a good a really good shake buying the 2001 61 re-issue. The nickel hardware has aged beautifully, they used the proper crown placement back then, and it was pre Nashville bridge (2003 and later). Nothing wrong with the Nashville bridge, just not fitting to put it on a 61 re-issue to me. Those years really are a good example of the 61 features. I do find it interesting that Gibson keeps attaching itself to the year 1961 though. Sure, it’s an important year for SG’s; no doubt. But they love making 61 re-issues. Even when the guitar itself has a completely different configuration than what we saw in 1961. Why not a 1970 re-issue, why not a 68 or a 69. All amazing guitars! No need for such focus on 61. In fact, I think if they did a run of 68,69 or 70 reissues they would sell like a hot damn. And they would barely have to change anything at the factory. SG nits would embrace the change and focus. I love my 61 reissue, amazing guitar. Play it almost every day. But the 61 reissue as a model has become over saturated. I would love to see some other years featured. Hell, I might even pick up another one if they chose another epic year and did a run. Take for example the 2019 61 reissue with maestro. How the heck is that a 61? I have yet to see a 61 with a maestro... why not make that same guitar and call it a 68. People would love it. Hehe, no doubt about it, pancake! Hehe ... I couldn't resist ... my post, dated January 24th. Hehe. Yeah, "Les Paul" is what the trussrod cover said in -61. That "SG" cover didnt show up before the seventies I think. That t.r cover is not a big deal, but I agree, after what I have read on ETSG it seems that Gibson should put more effort into nailing the details on so-called RIs. And that "61-hangup" ....A 1964 Gibson SG Standard RI? Yes please! i remember back then when the 2000/01 came out, most were saying that it was more apt to be called a '65 reissue. I see they installed the crown inlay at the historically correct location for a 1961-65 SG Standard. Maybe they should recall that 2019 SG Standard ‘61. Edit: IMO The 2000 Standard is pretty good replica of an mid/late '60's SG. My '00 Standard has a body consisting of one solid slab, real nice bevels (weighty too, compared to 2018/19 Standards), and a cool detail (that I hadn't realized until some weeks back) is that on the '00 Standard the brigde screws are screwed directly into the wood, which I believe was not common for Gibson "factory"/USA models, but used mostly for Historics/CS guitars. Please correct me if I'm wrong, guys. ...on the '00 Standard the brigde screws are screwed directly into the wood, which I believe was not common for Gibson "factory"/USA models, but used mostly for Historics/CS guitars. Please correct me if I'm wrong, guys. The ABR-1 was common on regular production models up until 2002. My 2000 SG Special has an ABR-1. 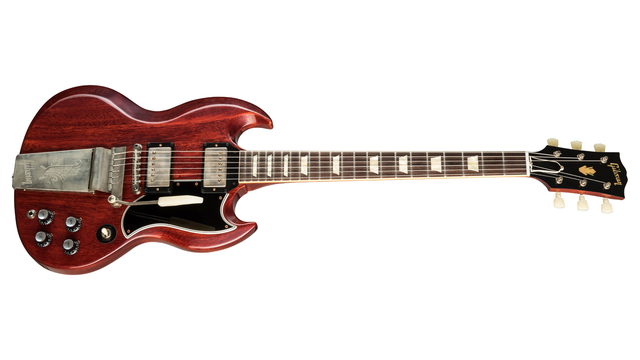 Many of the early SG Special Faded when they were released in 2002 had the ABR-1. By 2003 they switched back to the Nashville. They should bring back the Harmonica bridge as well. Ok, thanks, man. I had misunderstood a bit, cause I thought that the ARB was fastened to a set bridge posts on some ABR-fitted guitars. So all ABR-1 up to 2002 was like this? Yeah, the Harmonia should be brought back for a 2019 Reissue of SG Exclusive! With the T-top and the SuperDistortion pu-set! I want one badly! actually it was in reference to the now legendary 2000/01 limited edition '61 reissue with maestro. nowadays more popularly known as the same off the shelf model which derek trucks used, and also the basis from what his signature model is copied from. ABR-1 has posts threaded directly to wood. There might be recent models that have ABR-1 and use threaded inserts similar to Nashville. But that defeats the purpose. Ok, thanks, got it. I wasnt aware of that reissue. The 64 Reissue might be the nicest SG ever. Ray and pancake81 like this. It’s looking pretty amazing, for sure. Ray and Gahr like this. This is an interesting one. Finally Gibson acknowledges that SGs existed outside 1961! These are Custom Shop Historic models, so I would hope so! Technically, the Standard '61 follows precedent in that anything named "Standard" has the lower crown. I thought calling it a Standard was a strange move at first, but maybe they purposely avoided the word "reissue" this time because it's not supposed to be accurate, just a "tribute" like those Specials they made a while back? SG standard, arcticsg and cerebral gasket like this. Now, Gibson, hehe ... How about a cream SG Custom with '62/'63 specs but with a Tuneomatic and stop bar instead of any vibratojunk and with Grovers tuners, and 3 pickups - without covers! Get yourself a pre-2000 Custom. No vibrola and they used Grovers through most of the '90s. They are pretty uncommon though, seem to have been produced in very low numbers. Aim for the latest '90s year you can find, as they took longer than the '61 RI to fix some inaccuracies. The Customs went over to become Historic /CS models round 1993. I am aware of those models you mention. But to me it seems like most SG necks became fatter in the later '90s, but Im not sure. I want a slim fast neck. If I would get a Custom today: to me it seems I should go for a stock '86-'92 Custom. Not too crazy pricey either, those IMO. There are a few of those out there right now. But Im not getting another SG right now. I just have always wanted this guitar... Next year.. .. drooling in the meantime. They should all be the same "Slim Taper" profile as the '62 and '61 RI. Although Gibson's definition of "slim" is not the same as mine, certainly. And they do the final sanding by hand, so every example is going to be slightly different from the next.